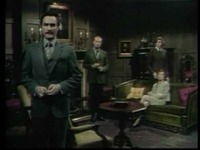 Humbert Allen Astredo (above left with Roger Collins, Barnabas Collins and Dr. Julia Hoffman) who appeared in numerous daytime dramas and played multiple roles on gothic soap opera Dark Shadows, died February 19, 2016. He was 86. Astredo was born April 4, 1929, in Pasadena, California, and spent much of his childhood in San Francisco. His family members were restaurateurs, but Humbert had no interest in joining the business at the Union Street Astredo’s Exchange. Instead, he considered becoming either a lawyer or an electrical engineer, but eventually took to the stage, appearing at the Hollywood Bowl in Faust. In 1965, he appeared at the New York Shakespeare Festival, followed in 1966 with roles at the Repertory Theatre of New Orleans. In 1968, he joined the cast of ABC’s Dark Shadows series where he played the characters of Nicholas Blair, Evan Hanley and Charles Dawson. He also played Dr. Forbes in the 1970 movie, House of Dark Shadows. In 1970, he split his time between Dark Shadows and Another World, where he played interior designer Joe Bruno. His other soap work included roles on The Edge of Night (Mayor Finley), One Life to Live (Bruno Weston), Love of Life (Dr. Applegate), Loving (James Preston), Guiding Light, Somerset, Texas, and For Richer, for Poorer. Astredo loved working on the stage. His Broadway credits included Les Blancs, Murderous Angels, An Evening With Richard Nixon and ... and The Little Foxes. He retired from acting in the mid-1980s and moved to Connecticut, where he pursued his passion for sailing. Astredo’s only child, Jennifer MacFarland Astredo, born in 1961, died of breast cancer in 2008. Source: Roger Newcomb, We Love Soaps, February 27, 2016.